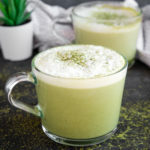 This Healthy Matcha Latte is a delicious way to enjoy the earthy flavour and health benefits of green tea, without refined sugar, dairy-free and vegan! Heat the milk in a small pot on the stove over medium heat until it reaches a simmer. Add the honey, maple syrup or agave to the milk, along with the vanilla, and whisk to combine until a foam forms on top of the milk. Add the matcha powder to a small bowl and pour the hot water overtop, stirring to make a liquid paste. (If you're making 2 individual servings in mugs, add approx. 3 teaspoons matcha powder to the bottom of each mug and pour 1-2 tablespoons of water into each mug, stirring well). Pour the sweetened milk over top of the diluted matcha and top with the foam. Enjoy, or store in mason jars in the fridge and re-heat to serve.